This scenic riverfront boulevard extends from Taidong Road to Dongchang Road along Huangpu River, and fronts onto Puxi across the river. It contains various parts, including a waterfront terrace, a green slope and a sunken plaza, among others. 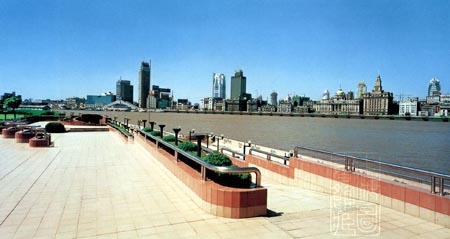 Gaze at the ships chugging on the river against a charming backdrop of buildings of various styles on the Bund. Especially at nighttime, the waterfront terrace affords unforgettable views of the lit-up classic buildings on the Bund of Puxi and the high-rises of Pudong.